I have been growing my natural hair for almost 2 years. As my hair grew longer the regimen has changed, but very slightly. The products that I have used are all the same, but the amounts have changed as well as the amount of days I wash, condition, style my hair, etc. I have been using a basic regimen and I have seen amazing results! I have never seen my hair grow so fast or so long in such a short amount of time. 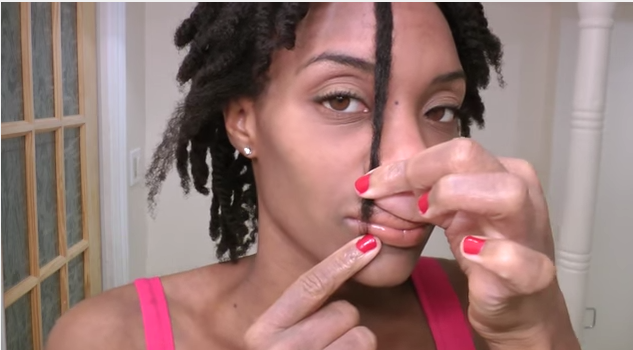 Rule of “Hair Growth” thumb is, people grow around 6 inches of hair a year. With my regimen I have been growing 5 inches a year! That is pretty good for someone who was suffering with hair loss and alopecia issues. The side of my hair with alopecia does not grow as quickly as the rest of my hair. But it is safe to say that hair growth, in any form or amount, growing out of a bald patch where alopecia once was, is extraordinary! 2) I wash my hair, with water only, 3 times a week. 3) I style my hair once a month. 5) I also use my shea butter mixture to retain moisture in my hair after washing or when I moisturize my hair. 6) I also apply coconut oil, when I feel like it needs it. 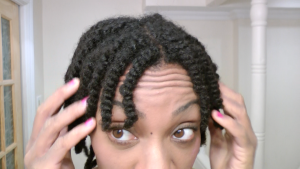 Once I have finished washing, conditioning and moisturizing my hair, I put my hair in a protective style. Keeping your hair moisturized is a essential part of any hair growth regimen. If your hair is dry, brittle and weak, there is no way you are going to see significant amount of hair growth. Well, that’s if you see any hair growth at all. When your hair is weak and damaged it is going to break off or worse yet, split. Once your hair is damaged, it will cause further damage and or hair loss to the rest of that hair strand. The more damaged hairs you have on your head, the more shedding, thinning and hair loss you will see. Keeping your hair moisturized is so important because moisture keeps your hair strong and reduces friction, which causes breakage and split ends. Moisturizing your hair is also very critical for hair growth and hair re-growth because it gives your hair an extra barrier of protection from the outside environment. At the same time, it allows the nutrients from the inside environment to penetrate on your scalp and hair strands to keep them strong and healthy. Since moisturizing your hair is so vital to your hair growth, you must make sure your products are as natural as possible. 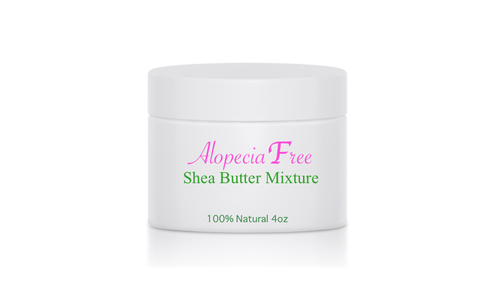 I only use my shea butter mixture (that has many essential oils for hair growth and hair re-growth) and coconut oil. You want to make sure your products are natural, because the products that you put on your hair and scalp are being absorbed by your hair strands, hair follicles and your body as a whole. We all know that what you feed your body will determine what you get out of it. We want healthy, strong, long growing hair so we must put in nutrients that will feed our scalp to help us to produce these kind of hair results that we are seeking. I moisturize my hair everyday to every other day. I make sure that I pay special of attention to my scalp and the ends of my hair. Firstly, I want to pay close attention to my scalp because I want to stimulate my scalp to get my hair growing (I will talk further on this shortly). This is major for us who have suffered or are still suffering from alopecia and hair loss. We want out hair to grow. This is a key part to doing that. We need to make sure our scalp has the nutrients and minerals it needs to allow new and healthy hair to grow. Secondly, I want to pay close attention to the ends of my hair. The very end of our hair is the oldest part of our hair and is prone to damage more easily. It is naturally weaker that the rest on the hair on the hair shaft. It doesn’t mean that it is damaged, it just means that is can be damaged more easily. I want to ensure that the ends are strong and healthy, which in turn will keep the whole strand of hair healthy. If your ends are split or damaged, it will only cause damage to the rest of your hair strand and in turn you will lose more of your hair. Since I know this about my hair I want to use an all natural products to give my scalp and hair stands the nutrients it needs to allow my hair to grow long, strong, healthy and flourish. I achieve this by using my Shea Butter Mixture. Every morning (or every other morning) I will spray my hair with a little bit of my homemade all natural hair spritz. The main ingredient is water, which our hair and body needs daily for health and vitality. I make sure all the strands and my scalp got a light spray. Once my hair is a little damp (not wet), I use my homemade shea butter mixture on my scalp (focusing on the thin areas, where the bald patch use to be). I massage that right into my scalp for a little bit and then I go ahead and use a little bit more and I lightly coat my hair strands. 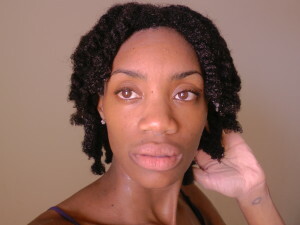 By doing this I seal in the moisture from the water and I protect and nourish my hair for the day. Once my hair and scalp is moisturized I cover my hair with my silk/satin scarf and I keep my hair protected for the day. If I am leaving my house, I will cover up my silk/satin scarf with a beanie hat or a wig for added protection with style. I will spray my hair with a little bit of my homemade all natural hair spritz. Once my hair is a little damp, I use my homemade shea butter mixture on my scalp and I lightly coat my hair strands. 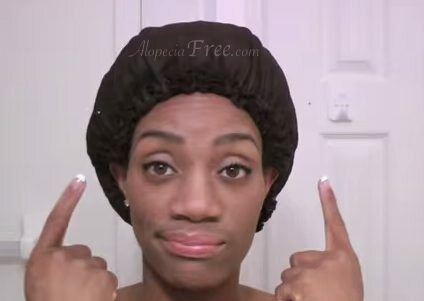 Once I have completed moisturizing my hair, I will cover up my hair with my silk/satin bonnet and go to sleep. If you don’t like sleeping with your head/hair covered, feel free to purchase a silk/satin pillow case and you can sleep on that. 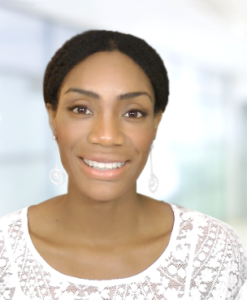 This is my Hair Growth Regimen and how I was able to keep my hair growing fast, long and healthy.